"A Thames Wharf," Samuel Scott, c.1757, Victoria and Albert Museum. N.A.M. Rodger writes in his oft cited The Wooden World that Royal Navy vessels spent most of their time in port. Rodger's assertion is almost certainly true of merchant vessels as well. The identification of the location of this scene has long been a problem which will probably remain insoluble. 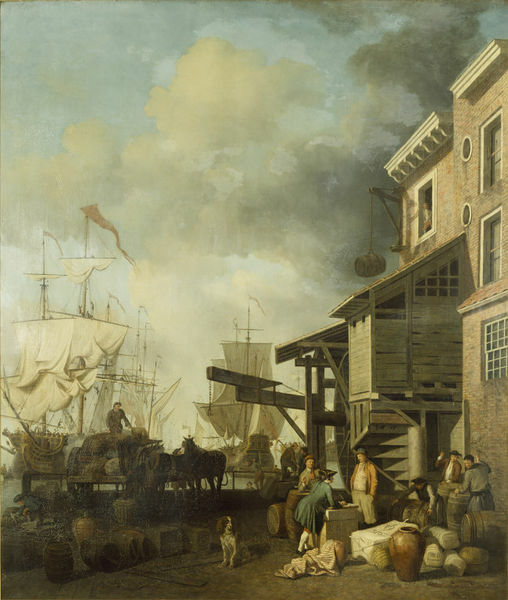 When bought the painting was entitled 'The Old East India Wharf at London Bridge', while the version at Fishmongers' Hall has been traditionally entitled 'Custom House Quay'. Another possible location which has been suggested is Bear Quay, which was next to London Bridge. All these seem to be unlikely, however, and it may well be that the scene is, in fact, a sort ofcapriccio or else should be located much further down river, possibly at Shadwell (where the East India Company had a warehouse), or at Deptford, or at Blackwall where the large East Indiamen customarily moored. The large bale in the right foreground is marked V.E.I.C. which does suggest the possibility of some connection with the East India Company. 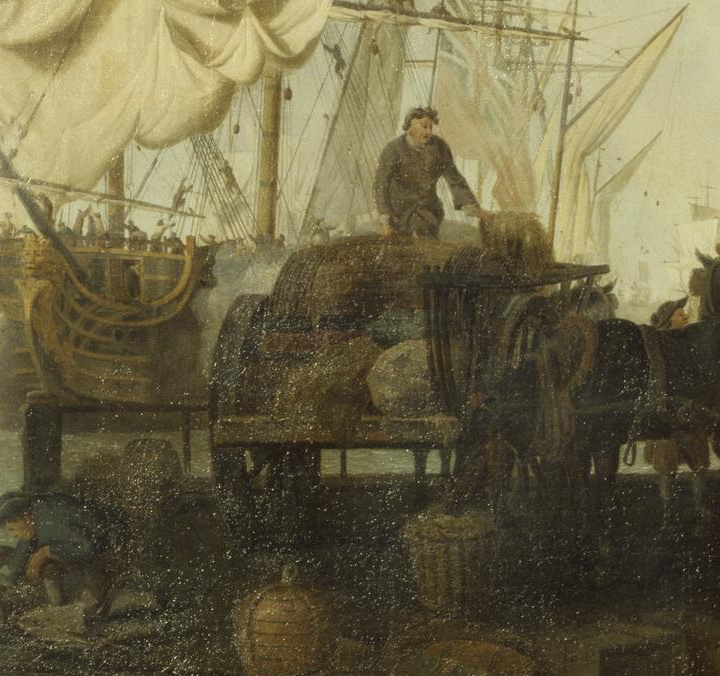 The ship moored at the left, however, is a two-decker man-of-war flying a commodore's flag. The men working at this wharf are connected to the sea, but likely not actual sailors. I will not be tagging this post as I do the others, as it does not reliably contribute to our knowledge concerning the dress of common tars. If I cannot separate the dock workers from the sailors, I risk muddling the two together. Nonetheless, Scott does show some similarities between dockside worker's clothing and that of tars, and he does help us flesh out the world in which the average sailor lived. In our first detail, we see a gentleman leaning across canvas bound bales to write in his ledger. He wears a blue frock coat with red breeches and a white cravat. His grey hair, or possibly a wig, is bound in a long and thin queue. Atop his head rests a black cocked hat bound in gold tape. Behind him are a pair of what may well be sailors. The fellow on the right wears a Canadian cap of blue, a short neckcloth of material that I can't quite make out, and a double breasted waistcoat with narrow vertical stripes. His jacket is a pale red or brown, and lined in white. His waistcoat is tucked into the slops/petticoat trousers that are bound with a single button at the waist. At his feet is the East India Company bale mentioned above. The fellow with the long pipe also wears a Canadian cap, though this one is red. At his neck is a white cravat. His jacket is double breasted with yellow metal buttons, lined in red, and made with slit cuffs. The gentleman in the previous detail looks to the work of these coopers. Given that the chaps we saw in the previous detail were wearing buttoned clothing and fur caps, one might assume that the weather is rather chilly on the Thames. Perhaps it is a testament to the work of our diligent coopers that they are in various states of relative undress. I confess myself unfamiliar with the tools and processes of the cooper, but to my untrained eye it appears that they are hammering hoops in place on barrels of dry goods. The man on the right is without a hat, but wears a smock or jacket with slops/petticoat trousers, and an apron. To the left is another cooper, this with a wide brimmed black hat, no waistcoat, white shirt, and brown coat or jacket with slit cuffs. Our last worker, who bends over to lift or set down a sizable barrel, wears a cocked hat, plain shirt, dark waistcoat, and slops/petticoat trousers. 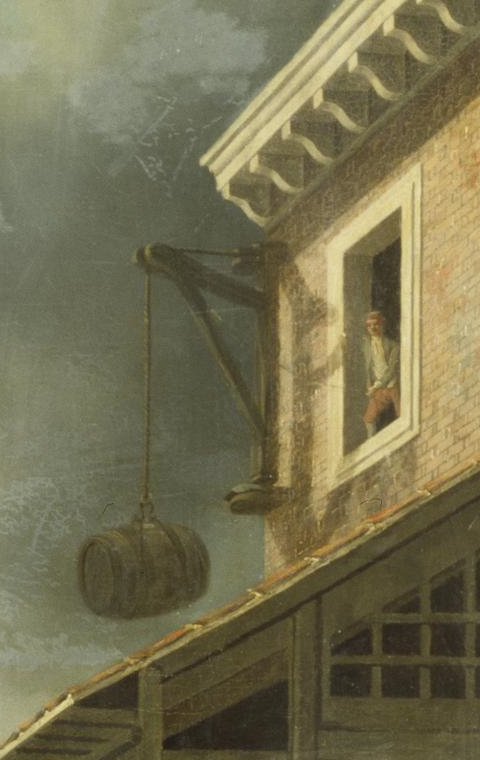 Leaning out a window is a man watching a barrel as it is hoisted or swung from a dockside warehouse. Though details are sketchy, he is without a hat, wears a white or very pale blue waistcoat, red breeches, and a blue jacket. This is very nearly the same outfit as the gentleman we saw earlier. In the background is a man of war flying the red ensign, with a telltale cloud of smoke that indicates her firing a salute. The workers ashore are unfazed. 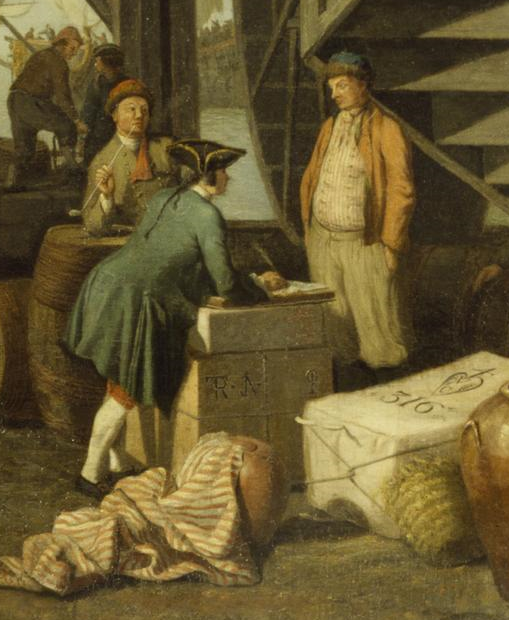 Among them is a man standing atop a cart full of goods, dressed in a single breasted grey or brown jacket and breeches, with a white cravat and no hat. 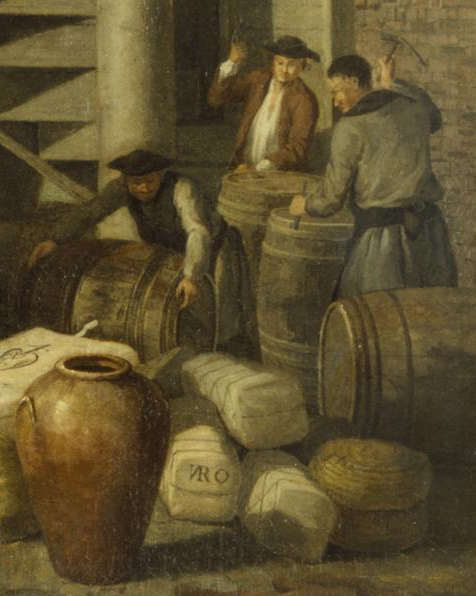 Despite the damage to the painting, we can also see that the man in the left frame of this detail wears a blue jacket with slit cuffs, gold brimmed black cocked hat, and brown or red breeches.